Global Research wishes to bring to the attention of our readers the following events in the following Canadian cities in late April, featuring speakers who bring first hand accounts of the situation on the ground in recent weeks. In tandem with Trump’s revived ‘Monroe Doctrine’, the Trudeau government is moving aggressively to carve out an imperial role for Canada in Latin America. Venezuela’s Bolivarian regime of Nicolas Maduro is the first target. Yves Engler – solidarity activist and author of several critical analyses of Canadian foreign policy. Dimitri Lascaris – Montreal-based lawyer, journalist and human rights advocate recently returned from fact-finding mission in Venezuela. 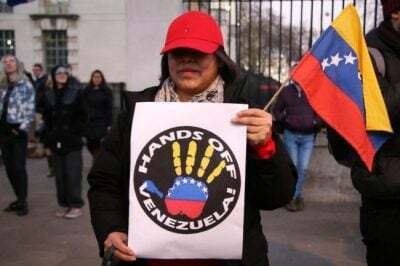 Mainstream media present a distorted picture of the situation in Venezuela. Come and hear different perspectives on this evolving situation which has the potential to destabilize the entire hemisphere. Find out why Canada is wrong to be supporting the overthrow of the Venezuelan government. Please share this post and invite your friends. Why is Canada involved in attempting to overthrow the President of Venezuela, Nicolas Maduro? Who is Juan Guaido? Who is the Lima Group? Free-lance Canadian journalist and human rights activist Eva Bartlett has spent years covering conflict zones in the Middle East and reporting the truth from the ground. Over the last few weeks she has been in Venezuela and will give an eyewitness report on the actual situation there and answer the many questions we may have.